After ignoring rural Whites for decades, the elites are feeling the wrath of the heartland. It was easy for the media talking heads to dismiss Trump’s popularity among White voters as “racism” rather than addressing his tangible benefits to them. CNN’s Van Jones even went as far as to call the Trump victory a “whitelash” from White America in response to the last eight years under a Black President. However, this so-called whitelash can be credited to a specific voting bloc once known as “Reagan Democrats.” These voters were blue-collar whites, previously inclined to only vote Democrat (due to their association with labor unions as well as the long lasting rural support for FDR’s New Deal policies) and switched to Republicans when Reagan ran, pushing him ahead to his massive electoral victories. These rural voters are primarily concentrated along the Great Lakes in the Rust Belt, but also occupy vast stretches of the Great Plains. In a post-election analysis, Nate Silver noted that, “by far Trump’s strongest demographic group, were disproportionately concentrated in swing states,” giving him an electoral advantage over Hillary Clinton. Geographically, these were the regions hit hardest by the deindustrialization of Middle America. Many of these areas suffer extreme destitution, such as Appalachia, where the poverty rate is 19.7% (compared to the 15.6% of the country as a whole). It should also be noted that Appalachia is 98.5% white. Despite the hype surrounding Obama’s “coalition of the ascendant,” the voters responsible for pushing him to victory lived in predominantly White counties. 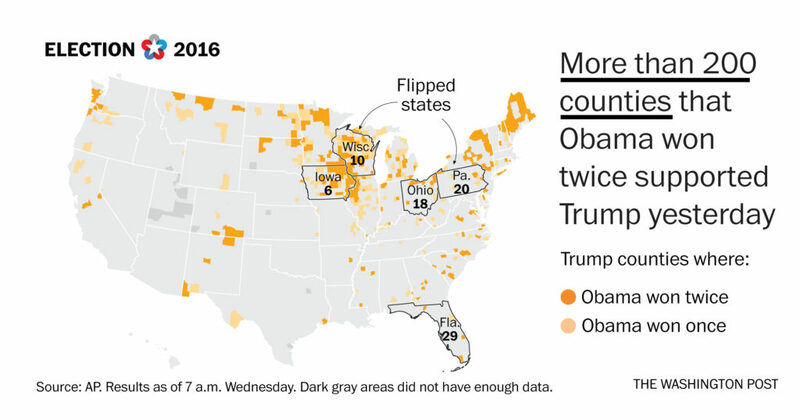 According to analysis by Dan Balz of the Washington Post, “Of the nearly 700 counties that twice sent Obama to the White House, a stunning one-third flipped to support Trump,” and he also won 194 out of the 207 counties that voted for Obama only once. Basic electoral analysis supports these socioeconomic conclusions. According to data from FiveThirtyEight.com, the most reliable predictor of how a district would vote was White socioeconomic status. The four quadrants of the graph are as follows: High-status/blue, high-status/red, low-status/blue, and low-status/red. Trump dominates his Republican competitors in each of these quadrants with the exception of high-status/blue counties, which tended to favor John Kasich (who I consider the absolute worst of the “principled conservatives”) or alternatively Marco Rubio. Additionally, high-status/red counties displayed strong support for Cruz and Rubio, but Trump still topped their popularity. 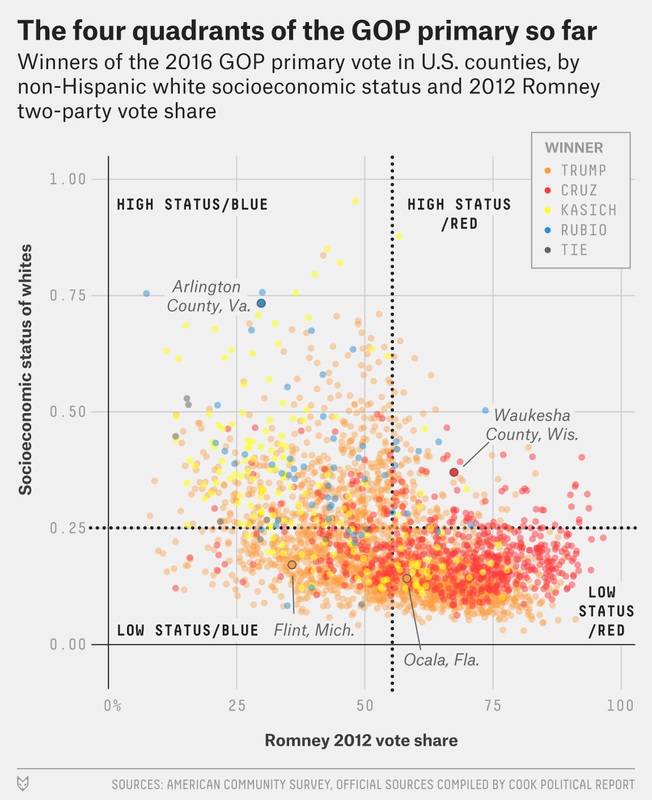 Interestingly enough, the counties Trump performed best in were low-status/blue, followed by low-status/red counties. Thus It can be concluded that areas where Whites suffer socioeconomic status are the biggest hotness of Trump support, regardless of that area’s demonstrated partisanship. In 2016, Pew Research Center examined the working-class Whites and their support for populism in both parties. The White working-class has made up a majority of both parties since at least 1992, when they comprised 67% of Republican voters. However, as the country became more educated, their numbers declined to 58% in 2015. Trump’s dominance over Cruz can be largely credited to this low-education majority, but the decrease is also indicative of the country’s changing racial demographics. In 1992, Whites made up 84% of the population, compared to 72% in 2015. This should be alarming for Republicans, who have always relied on consistent support from White voters and will continue to rely on them in the foreseeable future. Along with low-income, another data point proven to be a reliable indicator for Trump support was low-education. Nearly half of White voters with a high school diploma or less support Trump, as opposed to only 34% of college graduates and 27% of postgraduate degree holders. The breakdown of socioeconomic data also offers further evidence that working-class Whites have struggled, noting that the percent change from 1992 to 2013 in average earnings for White men 25 years old or older have increased 19% for college graduates and decreased 3% for those without a college degree. While educated Whites are finding it easy to get ahead, working-class Whites have not had the same fortune. In March 2016, Kevin Williamson wrote an article directing the establishment’s frustration with Trump at the American people voting for him. The article acknowledges a socioeconomic trend within the electorate that pollsters began noticing as more states cast their votes: Trump has massive support among working-class Whites and low-education voters. All of those factors have proven to be reliable indicators for support for Trump. The ivory-tower attitude of the National Review quickly concluded that this meant Trump voters are unintelligent and essentially low-brow. In another article during the 2016 election, Kevin Williamson criticizes these Americans of the Rust Belt for sticking around their declining cities and lectures them on the responsibility of learning new skills so they may follow economic opportunity. He suggests they should “get out of the ghetto or the barrio, get an education, get a job, and start a new life and a new family in some more prosperous corner of the county or country.” If escaping these conditions were that easy, these voters would have done it already, genius. In fact, the ones with enough agency, skill, or luck are capable of doing so, as Williamson wrote in a 2014 article (which lacked the condescension of his later articles). However, breaking free from the cycle of poverty is easier said than done. For starters, these people can’t afford housing elsewhere. Getting out of a decaying rural community is stuck in a paradox: leaving requires money, but there are no jobs to earn the money (which you want to spend in order to get a job). Living in a small town with no jobs or opportunity, young White people are often doomed to remain stuck there since they lack the economic means to move to a more prosperous area. A single factory can support the livelihoods of an entire county, so when that factory gets shut down it has devastating effects. What other employers are there in the middle of nowhere? The less fortunate can only find seasonal work and suffer sporadic unemployment; for the lucky ones, there’s Walmart, McDonald’s, Tractor Supply Co., or maybe a small grocery store. Others are forced to search for work elsewhere—even if it means an hour and a half commute to healthier job markets closer to a large metropolitan area. Rural communities also frequently lack sufficient infrastructure, making long-distance commutes difficult, inconvenient, and costly. When trying to escape rural poverty, every step of the way is an uphill battle. Latent with the emotional bias of the primary season’s #NeverTrump era, it is hard to seriously analyze much of what National Review had to write about the White working-class. Their didactic articles read like the frantic mania of an ideology that knows it’s going extinct. The National Review reaffirms the consensus of the so-called principled conservatives: Trump would supposedly be a disastrous, erratic candidate who would further alienate minorities from the GOP, and the party must instead nominate a principled “adult in the room” touting a message inclusive to Hispanics while continuing to ignore White Americans. 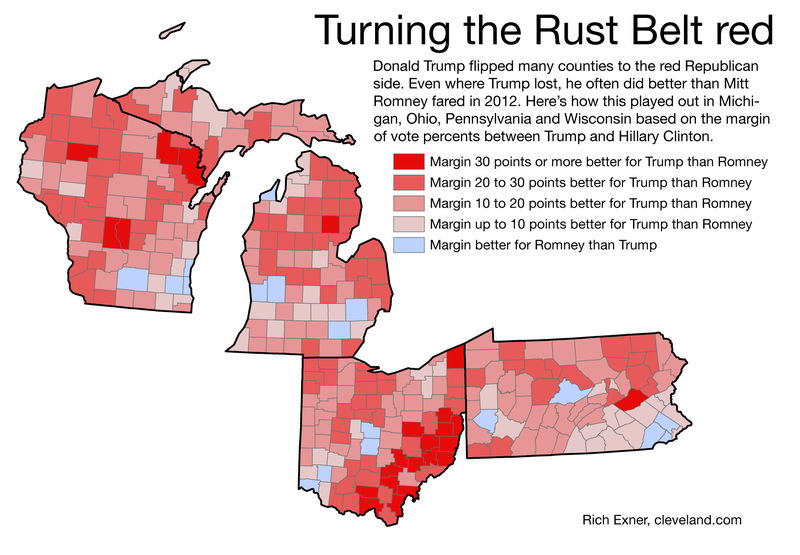 To understand the Rust Belt voter, Ohio is a good place to start. In 2008 and 2012, Obama was boosted to victory by some of the most impoverished counties in northeastern Ohio. Much of northeastern Ohio had not voted Republican since 1984, but in 2016 these voters once again turned out for the GOP. Northeastern Ohio faces a heap of economic challenges, including unemployment, stagnant wages, and diminishing property values—all of which are below that of the state average for these metrics. 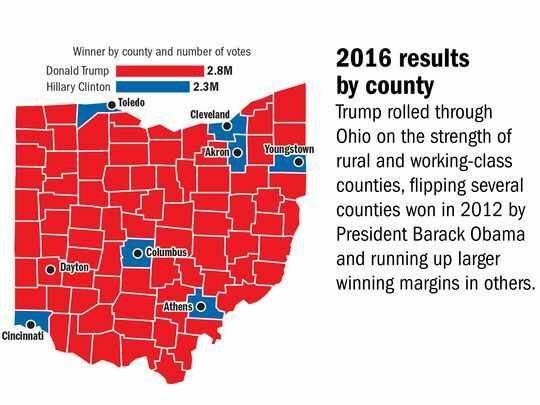 In Ohio, economic anxiety is not contained to the northeast. Isolated by a lack of infrastructure, other rural regions of the state have also suffered, such as in Ohio’s Appalachian corner, where 17.8% of families live in poverty, according to the most recent Ohio Poverty Report. While the country as a whole saw improvement after the recession, rural areas were left behind and continue to struggle with their economic recovery. “Poverty is the family tradition,” as Ohio native J.D. Vance wrote in his 2017 book, Hillbilly Elegy: A Memoir of a Family and Culture in Crisis, which I cannot recommend enough. The sense of sheer hopelessness in these areas is no better summarized than by examining suicide rates, which skyrocket once you pass the city limits. Most shocking to me was a study conducted by The Ohio State University which found that from 1996 to 2010, the youth suicide rate in rural areas was double that of in urban areas. This heartbreaking statistic serves as sober reminder of their predicament. This shift toward identity politics turned off many White voters the Democrats used to rely on. Energized by the possibility of the first Black president and the first woman president, the Democrats failed to notice they were closing the door on White voters. But the more consequential result of Democrats embracing multiculturalism has proven to be the rise of white identity politics. While Democrats are to blame for ignoring White voters, Republicans are no less guilty in their continued betrayal of White voters. Empty promises are made by the GOP, which appeases the base by paying lip service to social issues. Yet, when we look at the “culture war,” one must wonder what have conservatives actually conserved? Even in the span of just the last ten years, gay marriage evolved from a fringe issue to tiptoe around into a new norm made so mainstream that bright rainbow spotlights were shined on the White House in celebration of the Obergefell v. Hodges Supreme Court ruling. Republicans were too preoccupied with accommodating their donors in the financial sector to pay any attention to the most rapid cultural shift leftward since the 1960s. Older Americans are now living in a world vastly different than the one they remember growing up in. This alienation could only add to the mounting frustration of White voters. The anger from these broken promises has drained any remaining hope from entire swaths of the country, such as in Ohio, Appalachia, and other rural areas of the Midwest. These voters have finally had enough. Instead of an urbane, wonkish candidate like Mitt Romney or Paul Ryan, the voters decisively chose Donald Trump. Only Trump had the enigmatic fiery bravado to galvanize exceedingly indignant Whites, and the message was received.